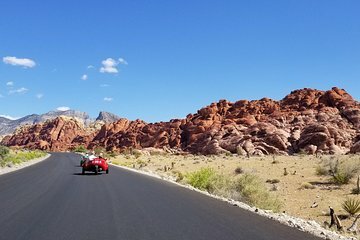 Explore o Red Rock Canyon, um destino favorito dos moradores de Las Vegas, em um divertido passeio de scooter de 3,5 horas com um guia experiente. Viaje pelo Deserto de Mojave e pela impressionante área de conservação com o seu guia, seguindo um belo circuito de 21 km ao redor do parque, além de aproveitar algum tempo livre para caminhar por conta própria. Obtenha ótimas fotos do cenário acidentado e pare no centro de visitantes para aprender sobre plantas regionais e vida selvagem. A coleta e o embarque no hotel, a água mineral e as taxas de entrada estão incluídas. Por favor note: preço exibido é baseado por scooter; veja o que você pode esperar abaixo para mais detalhes. Desfrute de cruzeiro ao ar livre como um passeio de bicicleta, mas sem o esforço físico no calor do deserto. Sua excursão começa com a coleta em seu hotel em Las Vegas e transfere para a área de Summerlin perto do Red Rock Canyon. Lá, o seu guia fornece o seu carro de scooter e analisa as diretrizes de segurança para as operações do carro. Depois de fazer alguns treinos, siga seu guia por cerca de 8 km em uma estrada asfaltada para chegar ao Red Rock Canyon. Pare primeiro no centro de visitantes, onde exposições informativas explicam a vida vegetal e animal do cânion e a história da tribo indígena Paiute, que já viveu nessa região. Em seguida, veja o parque de perto enquanto seu guia lidera seu grupo de carros de scooter em um circuito panorâmico de 21 km. Maravilhe-se com a série de desfiladeiros cênicos e formações rochosas esculturais encontradas dentro da Área de Conservação Nacional de Red Rock enquanto desfruta do ar fresco e de vistas panorâmicas de 360 graus. Você pode ver burros selvagens, tartarugas, coelhos e outros animais selvagens, juntamente com paredes rochosas que atraem escaladores profissionais de todo o mundo. Espere gastar aproximadamente 3,5 horas dirigindo e explorando a pé em paradas designadas ao longo do caminho. Seu guia pode recomendar excelentes trilhas para caminhadas que sejam adequadas ao nível de dificuldade desejado. Desfrute de uma perspectiva panorâmica sobre a área a partir do High Point Overlook, localizado a quase 5.000 pés (1.524 metros) acima do nível do mar, com vistas para a parte sul do Vale de Las Vegas. Sua excursão cobre aproximadamente 35 milhas (56 km) de ida e volta desde o ponto inicial em Summerlin. Durante as paradas, você pode alternar os motoristas e esticar as pernas. Os carros de scooter para 2 pessoas e 3 rodas são fáceis de conduzir; eles não têm embreagem ou engrenagens, e não exigem uma licença especial. Seu tour termina com o desembarque em seu hotel em Las Vegas. Por favor note: preço exibido é baseado por scooter; Se viajar em uma festa de 2 por favor selecione apenas 1 viajante.  Se você deseja ter scooters individuais, selecione o número de scooters que você vai precisar. Para operar os veículos, os clientes devem ser capazes de falar e entender o inglês básico para fins de segurança. Leo and Colby were wonderful tour guides. The whole trip was great!!! The scooters are fun and easy to drive!!! Can't wait to come back and do this Scooter Car Tour again!! An excellent tour of the Red Rock Canyon on scooters, we had a great, fun time, and hubby loved driving the scooter, playing like a young one again, even though we passed serious groups of bikers, he thought it was a laugh, our main guide Cody was great fun and Leo the other guide was very informative about the Canyon, a trip not to be missed, just wished it had of been longer, didn't want it to end. Excellent tour guides very fun, had 4 cars in our group from Nebraska. All 8 of us had a fantastic time. Really enjoyed both of our guides so fun. Thanks to them it was one of the best tours we have been on anywhere. Cody was our lead driver and not sure of the guides name that was in the back he was also exceptional good. We had a great time. The tour guides made the tour a lot of fun. Sights and views of the canyon were amazing. Cody and Eric were great. Loved the way they looked out for all of us. We had time to stop and take pictures. Cody even took pictures of all of us. Keeping us hydrated with water was a good idea. Even though the temp was 100 and we took the afternoon tour, it wasn't that bad. We suggest this tour to all. Picked up from hotel and just fun from then on. Shown how to drive the 2 seat scooter and then we were off. On the highway to start and then on to Red Rock Canyon loop. A few stops... very informative guides and plenty of cold water to drink. Had a blast, my husband drove the scooter and I sat in the back. We made the stops to view the mountains, dessert etc, the guide was fun and knowledgeable. I don't recommend this with kids. Even if you have a teenager, they have to be able to drive a motorized vehicle. But the tour was definitely well worth it, there is more to do besides just gambling when you go to Vegas and this tour was one of those. 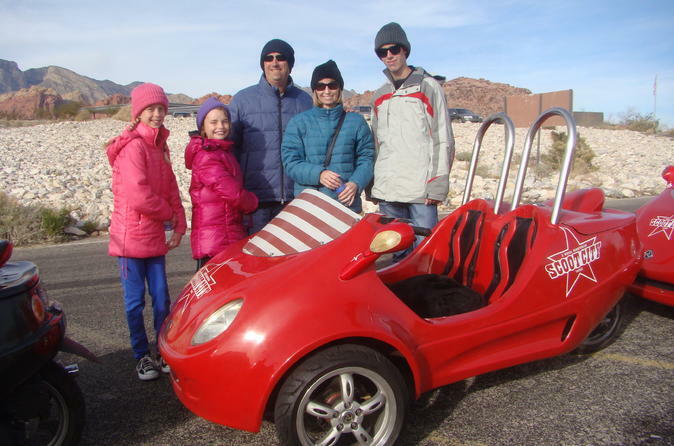 Great fun scooting along through the Red Rock Canyon in these little vehicles. The staff is wonderful, extremely helpful in getting everyone comfortable and scooter educated before the ride begins. And on the road they are funny and entertaining. We had a great day doing something I never imagined we would do. Thanks for a memorable experience!